Tagalong Bars are a homemade version of the classic Girl Scout Cookie…a buttery shortbread crust, with a sweet, creamy peanut butter filling, topped with rich chocolate. A fun twist on the original! Tagalong Bars are my contribution to Girl Scout Cookie season…which basically means I snagged their idea. I mean, not in a bad guy, thieving kinda of way, just in an “inspired by” way. That’s a thing, right? And plus, having purchased no less than 25 boxes of Girl Scout cookies this year alone I feel confident that I am doing my part. I just can’t say no to those cute girls selling cookies. Not that I even want to say no…I mean…you can only get them once-ish a year, so they’re totally rare, like an eclipse or locusts. I mean what happens in October when you need a Thin Mint? Panic! Anyhow, these bars are just a twist on the famous Tagalong that the Girl Scouts sell. And because I love me some bar cookies I wanted to make these in square form. First you just make a simple shortbread crust. I used Challenge Butter in this recipe, because it’s my favorite. If you have been a reader of my site for any length of time you know I use Challenge almost exclusively. It’s always consistently creamy, fresh, and delicious. It’s 100% pasteurized sweet cream and salt…that’s it. Using a quality butter in shortbread absolutely makes a difference! You simply bake the crust until it’s lightly golden and then let it cool! 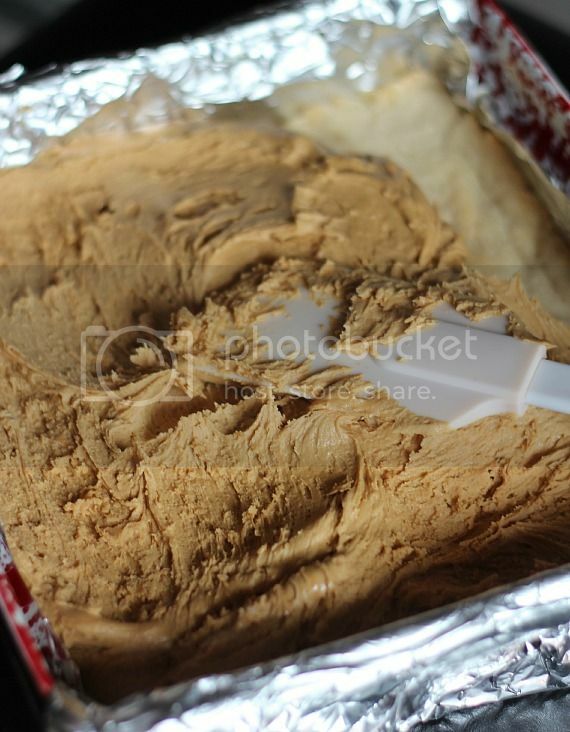 Next make the filling, which is simple…just peanut butter and powdered sugar. Chill the filling while you make your topping. It will make spreading the chocolate on top easier. Now chill it again so the chocolate layer sets and you’re ready to eat. Line 9×9 with aluminum foil. Spray lightly with cooking spray, set aside. In mixer fitted with your paddle attachment, cream butter and sugar for 1-2 minutes on medium speed until creamy, scraping the sides of the bowl as necessary. Turn the mixer to low and add in vanilla, milk, salt, and flour. Stir until incorporated and dough comes together. Press this evenly in your prepared pan and bake 15-20 minutes or until golden. Allow to cool completely before moving on to the filling. In the bowl of your stand mixer fitted with the paddle attachment cream the peanut butter and powdered sugar together until smooth. Spread filling evenly on cookie crust. 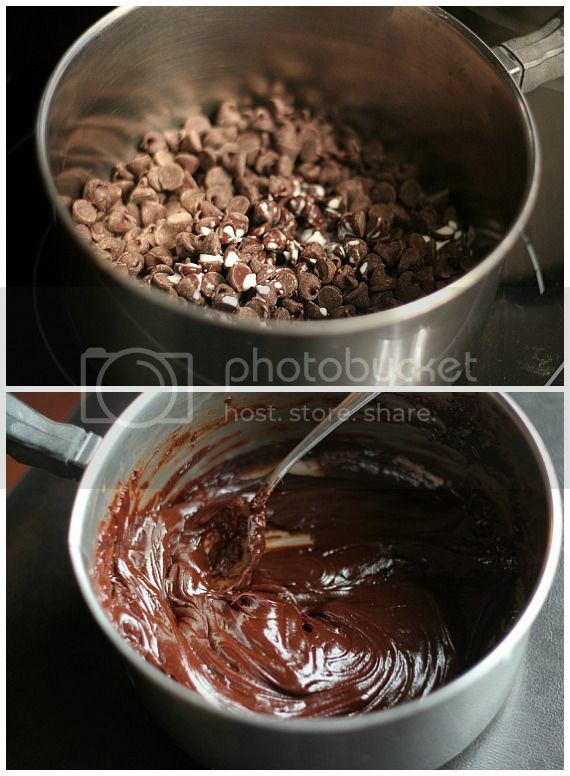 In a double boiler melt chocolate chips and cream until smooth. 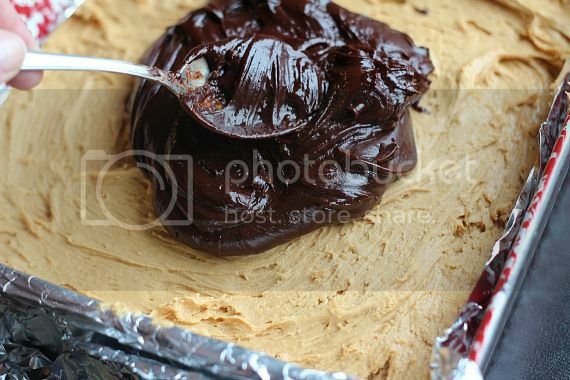 Spread on peanut butter layer. Chill until chocolate is set, about 30 minutes. *This post is in partnership with my long-term relationship with Challenge Butter. All opinions are my own. I want to tagalong these bars all day long! I would love to tagalong with you as you make these bars! Oh man. That shortbread crust looks like the perfect base to hold those amazing choco and pb layers! Um, I’ve never had a tagalong cookie and my daughter is a girl scoot. I’ll just make these bars to console myself now, please. LOL! That is embarrassing. It is the best cookie. I too have ordered a ridiculous amount of girl scout cookies, and they aren’t HERE YET. These are just what I need. I need a big batch of these right now! Yum! Oh yay! Thank you for making Girl Scout stuff from scratch. I always get all huffy and jealous when I see recipes that involve Thin Mints and stuff, just because I haven’t been able to find Girl Scout cookies since I was a girl scout. I don’t know why that is. Anyway, these look great! And so fun. There are somehow never ANY girl scouts near where I live so I almost always have to resort to homemade or going without. These bars sound way easier than making a gazillion cookies! Yum. Shelly, these look awesome!!! The peanut butter looks so creamy, I just want to dive in head first! Ohh, ohh and more ohhhh! And maybe a few la la’s too! We don’t get the Tagalong cookies here in the Uk so you’ve just provided me with the next best thing and therefore I love you [in a platonic way). Thank you mi’lady. Adding to my ‘to make and bake’ list. Please send a pan of these directly to my residence for arrival next Monday so that I may put the entire thing in my face while watching The Women Tell All and not feeling guilty one bit because even thought I just ate an entire pan of dessert bars at least I don’t act like Tierra. I am heading to the store once I pick up my little guy and get all the ingredients for these! Tagalong (along with thin mints) are my absolute FAVORITE GS cookie EVER! Nothing can ever be bad after that! I’m Canadian and SO jealous of the great flavors our American counterparts sell. We do mint, chocolate and vanilla…BORING! Might have to make some of these! Tagalong cookies were always my favorite! I am super excited about this recipe! Swoon! These look perfect, Shelly! I’ve made homemade tagalongs before but these are so much easier to make! These look so awesome! I want to reach through my screen to grab one! These look fabulous!!! Who doesn’t LOVE a Girl Scout cookie concoction!?! No one! The end. These look so good not to mention better than the actual cookie! I’ve never had tagalongs! They sound amazing! They look awesome and I actually have a similar recipe I saw elsewhere bookmarked. Now I think I have to make them! Beautiful and I want all those layers…now! That peanut butter filling looks so Goooooood! And with shortbread…. I need is a cold glass of milk! If they’re selling sawdust, I’d buy it to support our cute li’l girl scouts! Doll, these look wicked tasty. “Hey girl! I’ll tagalong with YOU any day!” lol! Ooooh, boy. Sorry, long day equals corny jokes. Great job with these! I’ve never had tagalongs, and rarely ever get any Girl Scout cookies (shoot, I know!) but maybe, just maybe I’ll make these! I’m gasping in excitement here! Wow, these really look good , can’t wait to try them! Are you trying to kill me??? Tagslongs anytime I want??? Oh dear! I wonder if a diet of salad and tagslong bars constitutes a balanced diet? Hi there – I tried making these tonight and the peanut butter filling was really stiff, not at all spreadable (and I even added some heavy cream). Is the filling recipe missing any ingredients? Some butter maybe? Hi! I went back and read the recipe and noticed that there IS a typo in the recipe… I only used 1 cup powdered sugar in my filling. So sorry I didn’t catch that! I updated the recipe to show the change. Good thinking adding heavy cream to make it spreadable…did they come out? ah! that’s it – thanks for the reply. The turned out find in the end. I just sort of patted down the pb mixture instead of spreading it. They were a big hit! These look amazing!! I know what I’m making next…. Oh dang. Those look good. I’m trying to hide out until all the ‘girls’ go away 🙂 Just kidding. I’ve never actually had a girl scout actually approach me to sell cookies. I can’t figure it out. Maybe because I’m too much of a hermit? Wow. These look wonderful! 😀 Girl Scout cookies….ahhh one of my weaknesses. We just ate our last Taglong last night. These look amazing! Oh my gosh, these look ridiculously good! Now I know what to make my dad for Father’s Day … he is a Tagalong ADDICT! I am apparently the only person in the US who doesn’t know a girl scout. Every year I run around looking for places to buy cookies. These bars could probably do a great job holding me over until I locate some cookies. I need my yearly do-si-do fix. when I saw these my eyes almost popped out of my head. this is seriously my type of dessert!!!!!! 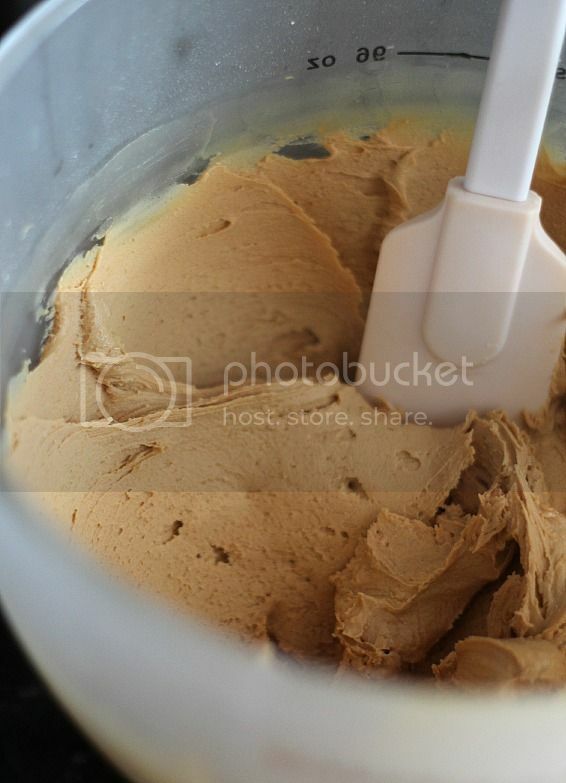 I am literally making this right now, shortbread in the oven, peanut butter layer ready to go. I make a similar cookie that I call “twix cookies,” which are pretty much my favorite bar cookie. So instead of the peanut butter, I use caramel. I must try this recipe! Who doesn’t love a tagalong?! I want to bury my face in there! Oh yum, your bars look so good! Have you ever made these and frozen them? Just curious. Looking for some delicious treats to make ahead for a dessert buffet. I haven’t ever frozen these, no, but I don’t see any reason why that wouldn’t work great! Yum!! I make everything from scratch but I can’t resist a Girl Scout selling cookies either! I have 3 boxes in my pantry now. But I’m planning on trying to incorporate them into a dessert. Your bars look amazing! My favoring GS cookies too! Currently on the 2nd step. Excited to try them! Perfect recipe for snow day! Awesome! I hope you love them! !